In an opinion piece posted last week on the limitations of access to crowdfunding projects, we made an argument for taking the initiative to explore sites that promote photographers from countries and cultures less frequently seen. We're following that post with a series of short profiles that will collectively provide a starting point for this exploration of international blogs, online magazines and pages. We began this week with suggesting a look at Kilele, We Take Pictures Too, and the Arab Image Foundation. 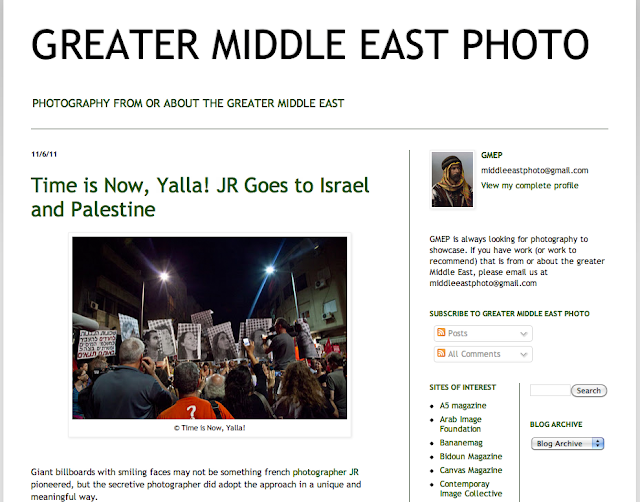 Today we continue with Greater Middle East Photo. Greater Middle East Photo (GMEP) is undergoing a site transformation and will be re-launching soon. In the meantime, there's archives that date to March 2010 on the site that collectively provide a look at photographers and images from or about the region. The anonymously run site lists galleries in the Middle East by country as well as more "sites of interest" to continue an exploration of the region's photography. Posts are a mix of informative investigations of historic photographers, looks at contemporary work, and commentary on news about the arts as well as the media of the region. GMEP can be followed on Twitter here. They are looking for contributors.